I'm over on Lillian's beautiful blog Unstitched today where she let me talk about our bookshelves and wax poetic about Austen. Check it out here! Hi Alli! So happy to see Julia and Jane keeping you company! :) We have bookshelves in four rooms of our home, we (me) are a teeny tiny bit book crazy! I would be lost without my library card. Craigslist has amazing deals on beautiful real wood bookshelves regularly. It is where we found all of ours. I need to paint them. Sigh. Someday! "My Life in France" is one of my all time favorite books! We have quite a few bookcases in our home, and they're all stuffed full! Like Michele, my husband and I have a bit of a book addiction! I don't have any bookcases so I'm in a situation much like yours. You've certainly done beautifully without them! Going to check out your guest post now. Can't resist anything about Austen! What great required reading! 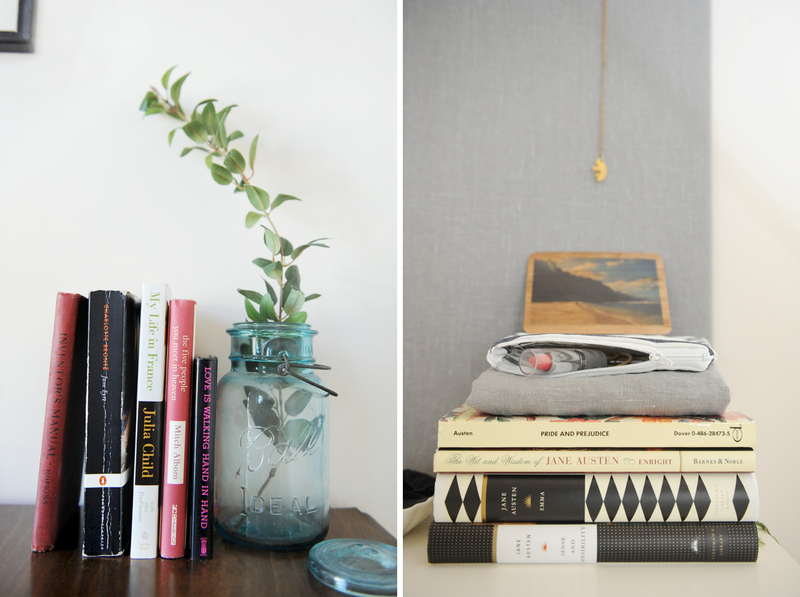 I love that you use your books as decoration - they are such great items to sprinkle about the home. I love bookshelves but I really love how creative you've gotten without bookshelves! Having books around makes a home feel so much more like a home. We don't own enough bookshelves for my liking and I often look longing at them in catalogues. Mine are in stacks just as yours are for now. We have more than our fair share of shelving in our home, and I'm almost certain they're due for an edit - I love the way you've styled your little collections. Yes, I do have bookshelf. But instead of books, I put a lot of other stuff in there. I also have a DVD shelf from bottom to top in one of my walls, looks pretty cool, not useful as well because I almost only watch movies in hard disk now. You have such nice taste. I love the way you set these books. Will head over to unstitched! loved reading you wax poetic about jane austen :) and the vintage books on your shelves melted my heart. such gorgeous illustrations/covers.